Liquid applied urethane coating that forms a very tough, high performance barrier. Protects and waterproofs concrete gullies, docks and marinas, tile and concrete pipes, chemical safety dikes and wash-out basins. Possesses excellent elasticity and will resist attack from the environment and from exposure to a wide variety of industrial chemicals. 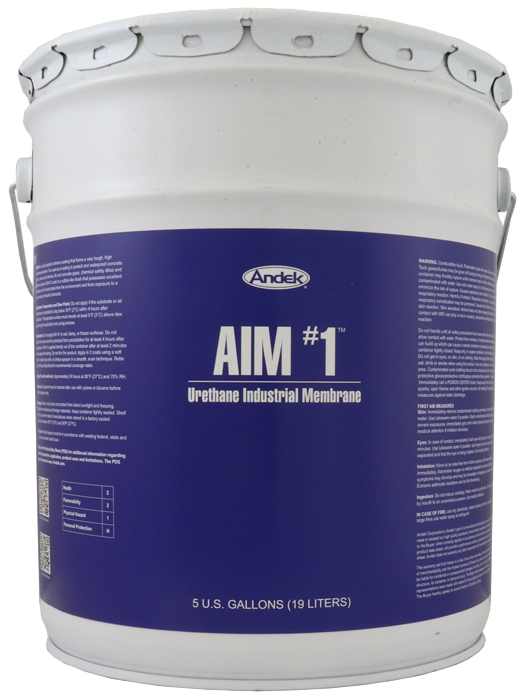 AIM #1 is a liquid applied urethane coating that forms a very tough, high performance barrier. It is used as a coating to protect and waterproof concrete gullies, docks and marinas, tile and concrete pipes, chemical safety dikes and wash-out basins. AIM #1 cures to a rubber-like finish that possesses excellent elasticity and will resist attack from the environment and from exposure to a wide variety of industrial chemicals. Provides a waterproof basecoat on concrete parking structures. Forms a tough, buried waterproof membrane beneath pavers, etc in plazas, balconies and outdoor recreation areas. Waterproofs basements, crawl spaces, tunnels, junction boxes and shower pans. Can be used over below pavers, bitumenous, concrete, fibreglass composites, insulation, most metals, mineral composites, wood, wood composites, rubber/plastic composites, and other surfaces. Do not apply AIM #1 to wet, damp, or frozen surfaces. Do not apply if the area cannot be protected from precipitation for at least 4 hours after application. AIM #1 is applied directly out of the container after at least 2 minutes of low speed drill stirring. Do not thin the product. Apply in 2 coats using a soft brush, medium nap roller, or airless sprayer in a smooth, even technique.